Two years ahead of the next presidential election, the public is divided over whether Barack Obama should run for a second term as president. 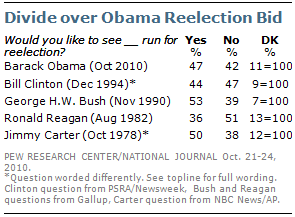 About half (47%) say they would like to see Obama run again in 2012, while 42% say they would not. This is better than the outlook for Ronald Reagan in August 1982; at that point, just 36% of the public said they wanted to see Reagan — who subsequently went on to win his second term by an 18-point margin — run for reelection. The latest Pew Research/National Journal Congressional Connection poll, sponsored by SHRM, conducted Oct. 21-24 among 1,006 adults, finds that the 47% who currently say they would like Obama to run again is comparable to public opinion about Bill Clinton on a similar question following the 1994 midterm elections (44% thought Clinton should seek the 1996 Democratic nomination, 47% did not). Opinions about whether Obama should run again reflect his overall approval rating. In the most recent Pew Research Center survey, 46% approved of Obama’s job performance. This was also the case for Clinton in December 1994, shortly after that year’s midterm elections (41% approval). As is the case with Obama, Reagan’s first two years in office were coupled with tough economic times and sliding approval ratings. Reagan’s approval ratings closely tracked economic indicators. According to Gallup polling, Reagan’s approval rating stood at 42% in August 1982 and bottomed out at 35% in the beginning of 1983. Opinions about Reagan’s political future at this time reflected this: In February 1983, as in August 1982, far more said that Reagan should not run for reelection (57%) than said he should (35%). Support for the president running for reelection is associated with partisanship, but partisan divisions over Obama running again are greater than they were for Ronald Reagan, George H.W. Bush or Bill Clinton during their second year in office. 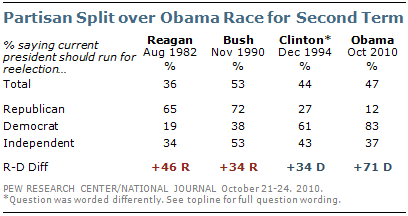 In August 1982, 65% of Republicans wanted to see Reagan run again, compared with 19% of Democrats — a 46-point gap. Similarly, following the 1990 midterm elections, 72% of Republicans said they wanted to see Bush run again in 1992, compared with 38% of Democrats — a 34-point gap. In 1994, there was a 34-point partisan gap over Clinton’s possible reelection bid (61% of Democrats vs. 27% of Republicans). Today, by comparison, there is a 71-point partisan gap over whether Obama should run again in 2012; more than eight-in-ten Democrats (83%) would like to see him run, compared with just 12% of Republicans. On balance, more independents say Obama should not run (47%) than say he should (37%). This balance of opinion is similar to independents’ opinions of a possible second term for Reagan in 1982 (47% did not want to see him run, 34% did). Voters are evenly divided over whether the country would be better off if Republicans win control of Congress on Nov. 2 or if Democrats hold on to their majorities, even as Republicans hold a wide lead in congressional voting intentions. Among registered voters, about a third (32%) say it would be better for the country if Republicans win control of Congress; an identical percentage (32%) says it would be better if Democrats maintain control. Still, 30% say it would make no difference. Those numbers change only slightly among likely voters: 38% say it would be better for the nation if the GOP wins control, 34% say it would be better of Democrats maintain their majorities and 23% say it would make no difference. A separate Pew Research survey released last week showed a 10-point edge for Republicans (50% to 40%) when likely voters were asked whether they plan to vote for the Republican or Democratic candidate for Congress. Although 61% of voters said which party controls Congress would be a factor in their vote — as many as said that in the 2006 campaign — 36% said party control would not be a factor. Republicans and Democrats overwhelmingly say the country will be better off if their party controls Congress (73% of Republicans say this, as do 67% of Democrats). About four-in-ten independents (42%), however, say it would make no difference. 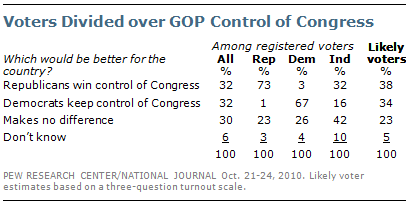 More independents say Republican control would be better for the country than Democratic control (32% vs. 16%). Voters also are divided on many proposals that have been floated by Republicans in the campaign and could become part of their agenda if they win control of one or both chambers of Congress. Three possible GOP proposals — allowing more offshore energy drilling in U.S. waters (55% approve), changing Social Security to allow private accounts for younger workers (51%) and repealing health care legislation — attract more support than opposition. Voters are evenly divided over a possible constitutional amendment providing that U.S. children of illegal immigrants would not automatically be U.S. citizens (46% approve vs. 46% disapprove). And about as many disapprove (48%) as approve (43%) of a possible freeze on all government spending, except for spending on national security. More voters disapprove than approve of two other possible Republican proposals — 52% disapprove of passing laws that impose greater restrictions on abortion and the same percentage (52%) disapproves of permanently extending tax cuts for those with incomes over $250,000. And there is more opposition (52%) than support (42%) for the prospect of major investigations of the Obama administration. A Gallup survey in October 2006, before Democrats took control of Congress, found that 51% approved of major investigations of the Bush administration while 47% disapproved of this. While Republican voters overwhelmingly approve of all of the possible GOP initiatives, there is particularly widespread support for repealing health care legislation (81% approve) and allowing more offshore oil and gas drilling (77%). Democratic voters disapprove of most these proposals by wide margins; however, only about half of Democrats disapprove of allowing more offshore oil and gas drilling (52% disapprove) and changing Social Security to allow private accounts for younger workers (48%). Independent voters’ views mirror those of all voters.